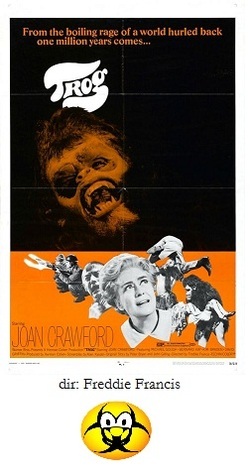 For someone who was a mega-star from Hollywood's Golden Age, Joan Crawford has done more than her share of crappy movies (Torch Song, Autumn Leaves, Queen Bee); however, the ridiculous Trog has to be the absolute worst. A group of spelunkers begin exploring a new cave in the English countryside and are attacked by a hideous creature that dwells there. Enter Ms. Crawford who plays Dr. Brockton of the Brockton Institute (you know, one of those Institutes that doesn't seem to have a purpose except for what the movie plot needs). She goes into the cave and spots the creature which she calls a troglodyte, half-man half-ape. They lure the beast out and immediately tranquilize it so she may take it to the institute for study. Brockton declares the creature as "the missing link", and proceeds to try and teach and tame it. Trog is, as you see, just another variation on the same theme that has pervaded horror movies since the beginning of time, so the idea is hardly fresh. There are so many reasons why it's even worse than you might think that I hardly know where to start. Joan Crawford is pretty awful here, in what was to be her last film, and looks positively blank-faced, showing no emotion and uttering her lines in a monotone. Her wardrobe is also pretty laughable; she is given various brightly-colored lab coats, so whenever there is a group of people in a scene, they are all dressed in sensible grays and tans, and Crawford stands out in hideous canary-yellow or cherry-red outfits that cause serious eye-strain for the viewer (the budget for this film was so threadbare, Crawford provided her own costumes. It's hard to say if this was a help or a hinderance). Crawford decides that the creature needs a name, so of course she calls it "Trog". Her "scientific" techniques to teach and train Trog are also quite bizarre. She connects to Trog through a wind-up doll, teaches Trog how to fetch, "Get the ball! Good boy, Trog", and tries to teach him colors "This is blue, Trog. Bluuuuuuue", despite the fact that Trog can't talk. That's remedied with an implant device for speaking purposes (which apparantly doesn't work, because it's forgotten about halfway through the film). Anyway, the local townsfolk become nervous about a prehistoric creature being nearby and organize a legal hearing to decide if Crawford is conducting worthy research (I don't know all about the English legal system, but I seriously doubt things like this happen on a local basis). Eventually a local hothead (Michael Gough) break into the Institute to kill Trog, only to allow him to escape, naturally causing him to wreak havoc around town. Trog overturns a car, which inexplicably explodes on impact (boy, I'm glad cars are better constructed these days) and even impales the local butcher on a meathook. Trog is chased back down into his cave and is immediately impaled on a stalagmite (or stalagtite, I don't know, whichever one that sticks up from the ground), leaving Crawford and the rest of the citizens a little sadder, but wiser for wear. Trog is truly ungodly. The performances are rotten, the Trog makeup is so bad it looks, at times, like it will slide right of the actor's face (apparently, they used a leftover monkey mask from 2001: A Space Odyssey), and everything proceeds at a snail's pace to idiotic situations. It's really sad to see such a huge star be consigned to the Z-grade abyss of films like this. But, hey, a girl's gotta eat.